This is but just a part of a big problem. Bhutanese buyers think Nu.100 to too much for a magazine, when they can pay the same amount to photocopy ten pages in black and white. Just go to a photo studio and have a copy of your picture printed in A4 size, I don’t know about Phuntsholing and Thimphu but in Wangdue it is Nu.300. Now look at a Magazine; it’s over 130 pages of full colored pages with write-ups. The cost we are paying for a magazine can actually buy just a page of it or an empty book. A Magazine or for that matter a newspaper, survives on advertisers and sponsors but our country has very few companies which can afford such luxury. And this few find no reason why they should be advertised in Bhutan when they are already more than known to everybody. So it is hard to dream of a Magazine in Bhutan. And it is harder to dream of it when there are more magazines coming up because the sponsors are the same companies who didn’t see any difference after having being advertised in those former magazines. Except for Tashi Delek (in-flight magazine of DrukAir) no magazine ever saw their second issue. Bhutan Now was the first and therefore the first to fail. 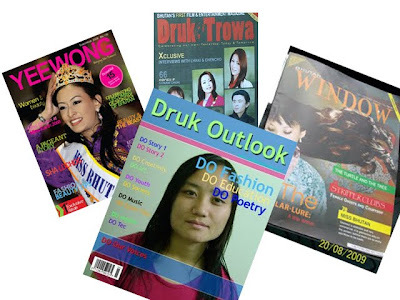 Bhutan Window, Druk Trowa and Yeewong are the produce of 2009 and they are yet to see their second issues. I am positive as much as they are but until then Ngawang and I should put aside our dreams. At least we should wait for our country to come up with a company that can either make a shirt or a soap which is worth advertising and therefore that company is willing to sponsor our magazine. It is a big dream, and a wonderful one too. But like you PaSsu, I have the fear to sustain it. That is exactly what I was talking with him yesterday. I told him that I wish I had his guts. But you and I should support him in all small ways we can. Thank you PaSsu, it is so nice of you. And what a coincidence, your ideas of a magazine and mine are exactly the same! I think it should be cheap yet useful. High quality paper is a luxury but not so important. I exactly had Student Today in mind. And also you are right about the question of survival and tough competition. But I am sure with people like you and kuenza on my side, we can turn those dreams into reality. Kuenza, you are in my list of writers for Ngawang's Dream Magazine.